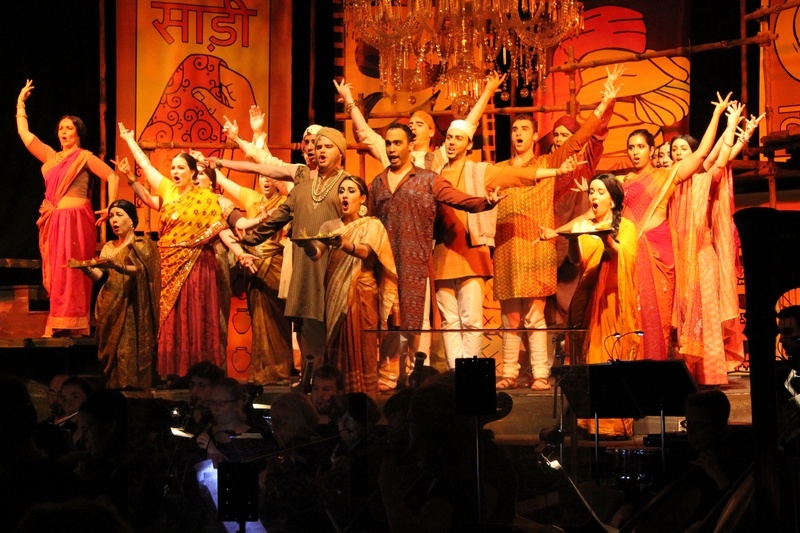 For a House with Diana Eck, a professor of comparative religion studies and Indian studies, as a House master, it was only appropriate for Lowell House’s Opera Company to choose “Lakmé” as their 2014 production. The opera, directed in music by Lidiya Yankovskaya and on stage by Roxanna Myhrum ’05, runs from March 26 to April 5 in the Lowell dining hall. Léo Delibes, who wrote the opera in 1882, was one of the many composers of his day to become entranced with orientalist styles and music. Although two of its numbers—“The Flower Duet” and “The Bell Song”—are commonly heard in the operatic repertoire, the opera as a whole has not been performed in the Boston area since 1914. Though the plot is wanting, the production succeeds due to the beautiful score, brought to life by its talented musicians and singers. Singing truly elevates the show, though many of the soloists are difficult to hear in the beginning of the first act and need time to adjust to the difficult acoustics of the Lowell dining hall. Liv A. Redpath ’14, who plays Lakmé, sings gorgeously with a full, clear voice that reaches to the back of the room. Her counterpart in Garry McLinn, who plays Lakmé’s lover, Gérald, started weaker, his opening in “Prendre le dessin d’un bijou” seemingly rushed, but almost immediately became one of the strongest voices on stage. Only Nathan Rodriguez’s Nilakantha is wanting: as the stern priest, Rodriguez seems only holy, not the vengeful father wishing death upon the British as he is meant to be. Though there is palpable chemistry between Redpath and McLinn, the best duet moments are captured by the more platonic relationships in “Lakmé,” namely, those between the title character and her two servants, Mallika (Heather Gallagher) and Hadji (Brian González). González’s acting gives life to a small part that often exists only as a plot device. His devotion to Redpath’s Lakmé is clear both in his physical movements onstage and his singing, loud enough to be heard but soft enough to show deference. When Gallagher and Redpath are set with the challenge of singing the famous “Flower Duet,” their duet is lovely—though at times a bit slower than the standard performance, the soprano and mezzo-soprano are completely in sync with each other. Though opera showcases voices, no performance would be truly operatic without the orchestral accompaniment. While the strings had slight intonation problems at the beginning of the first and third acts, the overall effect is that of an extremely competent pit orchestra, accompanying the singers without overshadowing them. Yankovskaya did an incredibly good job of keeping the singers and orchestra together while allowing the soloists enough artistic freedom to give the numbers real and believable emotion. Music, choreography, and acting work beautifully together to bring the opera to life, but their backdrop is not quite as impressive. A series of cloth paintings, changed for each act, distracts from the action on stage rather than enhancing it. In particular, the first act’s stylized bright green paintings of leaves and Hindu gods drew the eye from the actors, who are beautifully (and accurately) attired in neutral colored costumes that unfortunately allowed them to be lost in the scenery. However, the negative aspects of the production only stood out because they were contrasted with the otherwise high quality of the production, which was well coordinated and lyrical, bringing color to Delibe’s vision of India.